These kid-friendly environments influence a child's ability to perceive and process information by employing abstract shapes that invite them to go beyond established boundaries. This week’s Kid's Caves roundup features kid-friendly spaces with a fresh take on the concept of playroom and kindergartens. These clean, open spaces are designed to encourage children to interact with the environment and to use their own imaginations. 1. DM House by Brazilian architect Guilherme Torres. 2. Erika-Mann Grundschule II by Die Baupiloten. 3. Spring Learning Center is Hong Kong's newest creative wonderworld for children. Designed by Joey Ho Design. 4. AVION Seoul Grandpark Kids Cafe by M4 Studio. 5. BOLLES+WILSON's St. Sebastian Church turned kindergarten in Münster, Germany. 6. Education Center designed by Sarit Shani Hay. 7. Ice Cream Castle by Scenario Interior Architects. 8. 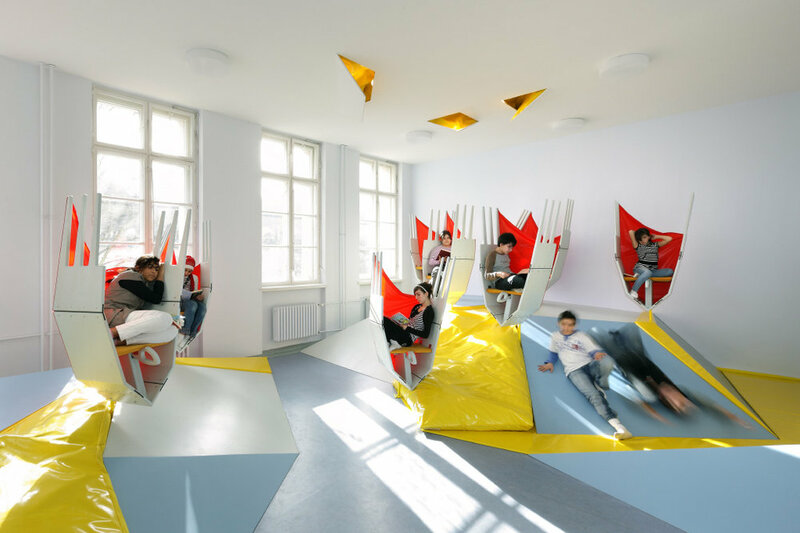 French architecture agency Palatre & Lecléredesigned Ecole Maternelle Pajol in Paris. 9. Activity Space for Children and Youth, David Citadel Hotel, Jerusalem designed by Sarit Shani Hay. 10. Kita Drachenhöhle by Baukind.